The combination of Wolff–Parkinson–White (WPW) syndrome and rheumatic mitral stenosis (MS) is rare in clinical practice. The management of this condition primarily depends on the clinical picture. We describe a 26-year-old male patient with no significant previous medical history and who came for a routine medical assessment before entrance to a police academy service. He was found to have rheumatic MS and WPW. The coexistence of Wolff–Parkinson–White (WPW) syndrome and rheumatic mitral stenosis (MS) is rarely reported in the literature.,, Treatment of this condition is challenging because of its rarity, and there are no established guidelines. Management primarily depends on the patient's clinical picture and the decision of the multidisciplinary team. In most of the reported cases, simultaneous radiofrequency (RF) ablation and surgery were performed,, while in some, ablation was performed before surgery. One reported case was treated with commissurotomy with long-term disappearance of the preexcitation syndrome. To our knowledge, this is one of the very few reported cases in the literature of this clinical entity that combines percutaneous transmitral commissurotomy (PTMC) and RF ablation of the accessory pathway. A 26-year-old male patient with no significant previous medical history was seen in our hospital after being referred for an abnormal electrocardiogram (ECG). Apart from a history of occasional palpitations, he was completely asymptomatic. On physical examination, he had loud S1 and a rumbling mid-diastolic murmur that followed an opening snap. Initial 12-lead ECG was suggestive of WPW pattern with septal posterior accessory pathway [Figure 1]. 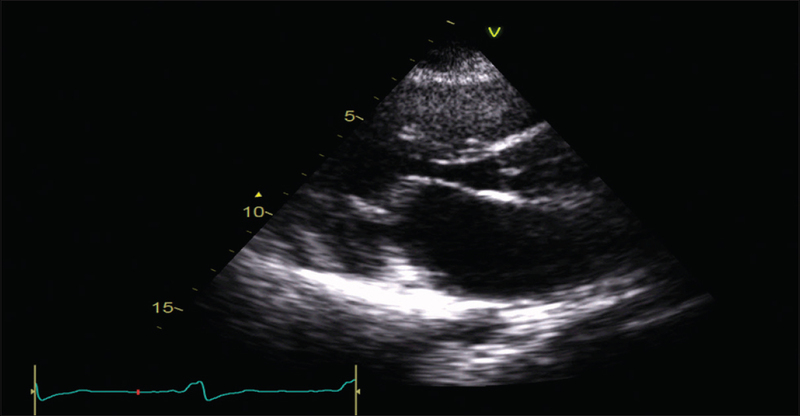 Transthoracic echocardiography showed normal left ventricle systolic function with ejection fraction of 57%. There was moderate-to-severe MS with mitral valve area (MVA) 1.3 cm2 by pressure half-time method and 1.2 cm2 by proximal isovelocity surface area method. Mean diastolic gradient was 9 mmHg at a heart rate of 75 BPM. The Wilkins score was 6/16. The right ventricular systolic pressure at rest was 32.5 mmHg. The left atrium was severely dilated by a volume of 104 ml with no left atrial masses or thrombi [Figure 2] and [Figure 3]. Exercise echo was not done. Collaborative decision between the interventionist and the electrophysiology (EP) team was made to admit the patient for PTMC followed by RF ablation of the accessory pathway in the same setting. The patient underwent PTMC first. The right femoral vein access was established. 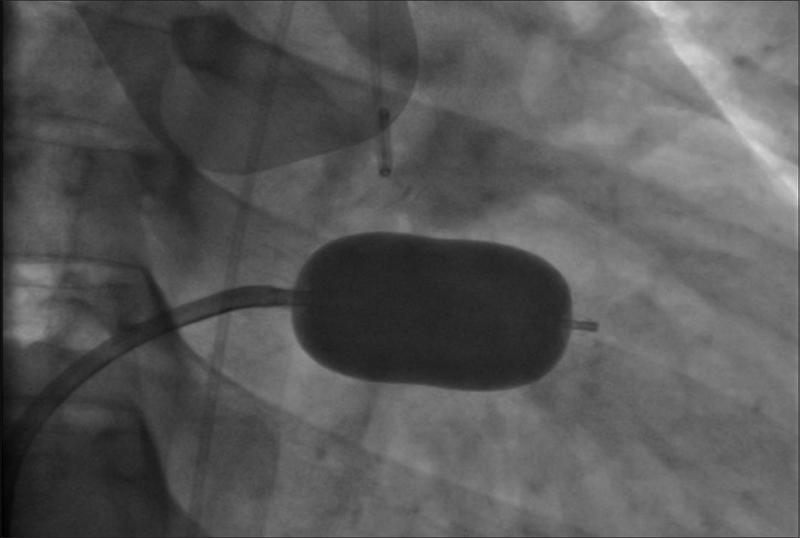 The atrial septum puncture was achieved using a 21G Brockenbrough needle and dilated with a 14F dilator and 28-mm balloon passed through across the mitral valve ring, and four inflations were done. The mean mitral valve gradient dropped from 20 to 5 mmHg. There were no immediate complications [Figure 4]. Transthoracic echocardiography performed immediately after PTMC and showed a MVA of 2.5 cm2 by planimetry method with a mean diastolic gradient of 3.93 mmHg at a heart rate of 75 BPM. Overall, left ventricle systolic function was normal. 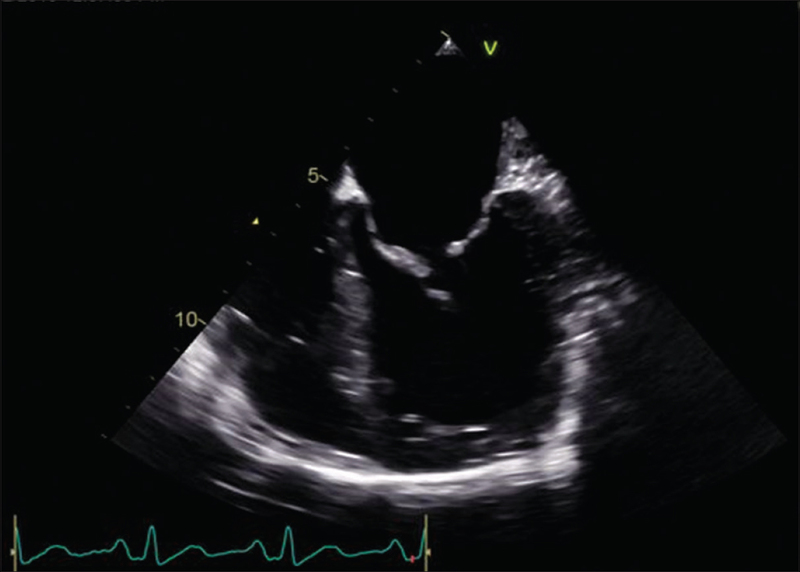 No mitral regurgitation (MR) was detected [Figure 5]. One day after the procedure, echo findings were unchanged. Immediately after PTMC, the EP team took over and started the RF ablation of the accessory pathway, using the same femoral vein approach. During the EP study, in the basal state, hepatic vein interval was measured as 12 with preexcitation pattern suggestive of right posterior pathway. There was good ventriculoatrial (VA) conduction, and a narrow QRS tachycardia was easily inducible by atrial and ventricular pacing. The tachycardia cycle length was 274 ms, and mapping of the tricuspid annulus showed earliest retrograde atrial activation and VA (fusion of local ventricular and atrial signals) at 8 o'clock tricuspid annulus location. Ablation with the D curve biosense webster nonirrigation catheter was done during tachycardia as the patient was going into recurrent tachycardia. Ablation was successful and the tachycardia terminated and preexcitation disappeared in 3.4 s of ablation [Figure 6]. Thereafter, the patient was completely asymptomatic; he was prescribed a monthly benzathine penicillin injection and discharged home. 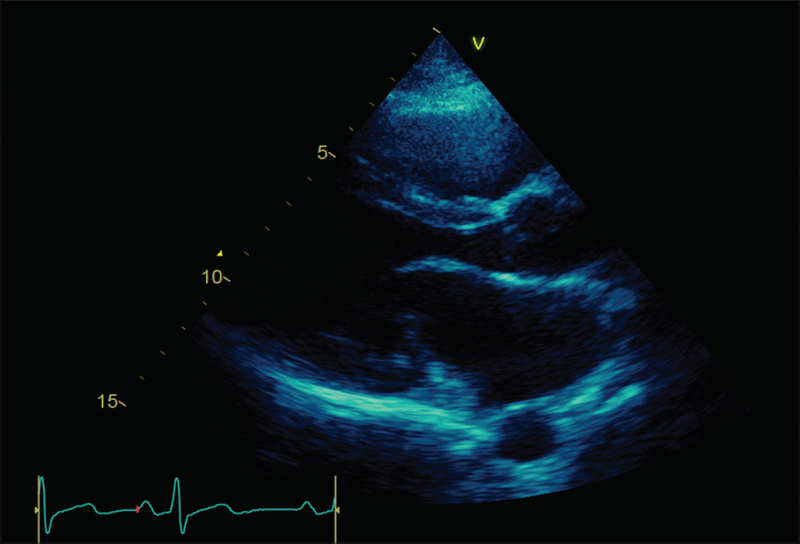 The patient was followed up after 1 month by both EP and interventionist team, in which he denied any symptoms and had normal ECG [Figure 7] with echocardiogram findings similar to the immediate postprocedure echocardiogram. The combination of WPW syndrome and rheumatic MS is rarely reported in the literature.,, The main concern in this combination is that it may lead to a life-threatening preexcited atrial fibrillation (AF) which could be refractory to medical therapy. The prevalence of rheumatic heart disease (RHD) remains high in developing countries such as South Asia and Africa. It affects predominantly those living in poverty and overcrowded areas with inadequate access to health care. Estimated age-standardized prevalence of RHD in 2015 was 444 cases/100,000 populations in endemic countries in contrast to only 3.4 cases/100,000 populations in nonendemic countries. This prevalence could be even underestimated as patients living in poverty areas seek medical attention when they only become really symptomatic. Systemic review and meta-analysis studies found seven to eight times higher prevalence in clinically silent RHD detected by echocardiography. The most common manifestation of RHD is MS. It remains latent for a long period until an average age of 30–35 years. Once a patient develops the symptoms, the progression will be faster and the prognosis will be dramatically worse with a high risk of complications, especially AF. Although our patient does not have AF, the risk to have it is very high reaching up to 45%. It is a poor prognostic indicator, especially with this fatal incidental combination. This has been partially attributed to the increase in left atrial pressure and consequent left atrial volume, resulting in structural alterations in the atrium and disruption of normal architecture. On the other hand, WPW syndrome is infrequent, occurring in <1% of the general population. WPW syndrome results from an accessory pathway that directly connects the atria and ventricles and bypasses the atrioventricular (AV) node. Patients with WPW alone have unexplained higher incidence of AF of about 10%–38%. If AF develops in a patient with WPW, the normal rate-limiting effects of the AV node are bypassed, and the resultant excessive ventricular rates (sometimes 200–240 beats/min) may lead to ventricular fibrillation and sudden death. Despite the minimal symptoms our patient had, we decided to treat him for both MS and WPW to reduce the risk of sudden death from this fatal combination due to his high risk of developing AF. According to the literature search, most of the reported cases had either simultaneous RF ablation or surgery performed, while in some ablation was performed before surgery. PTMC was performed in our patient rather than surgery because of the suitability of mitral valve, his young age, and the patient's preferences. PTMC and ablation were successful in our patient. Subsequent follow-up of the patient in the clinic showed complete disappearance of his palpitation as well as the delta wave in ECG. Follow-up echocardiogram showed an MVA of 2.5 cm2 and a gradient of 4 mmHg and no MR.
WPW syndrome and rheumatic MS are a rare combination. It should be recognized by clinicians as it can trigger refractory AF and leads to fatal complications. PTMC and ablation are a successful treatment option in selected cases. Reporting of more cases is required to facilitate the formulation of standard management and possible guidelines. Written consent was obtained from the patient for publication of this case report and any accompanying images. A copy of the written consent is available for review. Alper AT, Hasdemir H, Akyol A. Wolff-Parkinson-White syndrome and rheumatic mitral stenosis: An uncommon coincidence that can cause severe hemodynamic disturbance. Indian Pacing Electrophysiol J 2008;8:304-7. Maheshwari M, Mittal SR. Wolff-Parkinson-White syndrome and rheumatic mitral stenosis – An uncommon association. J Assoc Physicians India 2010;58:388-90. Ikeshita M, Yamate N, Tanaka S, Asano T, Harada A, Yamauchi S, et al. Acase report of simultaneous surgery for Wolff-Parkinson-White syndrome combined with hemolytic anemia and mitral stenosis. Jpn Circ J 1996;60:171-6. Otani Y, Morishita Y, Ishikawa S, Hamada Y, Otaki A, Yoshida I, et al. Successful treatment of Wolff-Parkinson-White syndrome with concomitant mitral stenosis by simultaneous surgery. Surg Today 1996;26:196-8. Lee CM, Lee YT, Liau CS, Chen MF, Chen CC, Chu SH, et al. Acase of Wolff-Parkinson-White syndrome with bilateral atrio-ventricular accessory pathways and mitral stenosis successfully treated by surgery. Taiwan Yi Xue Hui Za Zhi 1987;86:1012-7. Lesh MD, Rankin JS. Coexisting Wolff-Parkinson-White syndrome and cardiac valve disease: A staged treatment approach with catheter ablation before operation. J Thorac Cardiovasc Surg 1993;106:1234-6. Iliceto N, Ginevrino P, Leone A. Mitral stenosis and the Wolff-Parkinson-White syndrome. (ECG findings in a case treated with commissurotomy with long-term disappearance of the pre-excitation syndrome). Acta Chir Ital 1968;24:695-712. Weinberg J, Beaton A, Aliku T, Lwabi P, Sable C. Prevalence of rheumatic heart disease in African school-aged population: Extrapolation from echocardiography screening using the 2012 World Heart Federation Guidelines. Int J Cardiol 2016;202:238-9. Diker E, Aydogdu S, Ozdemir M, Kural T, Polat K, Cehreli S, et al. Prevalence and predictors of atrial fibrillation in rheumatic valvular heart disease. Am J Cardiol 1996;77:96-8. Arvmidson H. Angiocardiographic observations in mitral disease-with special reference to volume variation in the left atrium. Acta Radiol Suppl 1958;158:1. Bailey GW, Braniff BA, Hancock EW, Cohn KE. Relation of left atrial pathology to atrial fibrillation in mitral valvular disease. Ann Intern Med 1968;69:13-20. Kobza R, Toggweiler S, Dillier R, Abächerli R, Cuculi F, Frey F, et al. Prevalence of preexcitation in a young population of male Swiss conscripts. Pacing Clin Electrophysiol 2011;34:949-53.